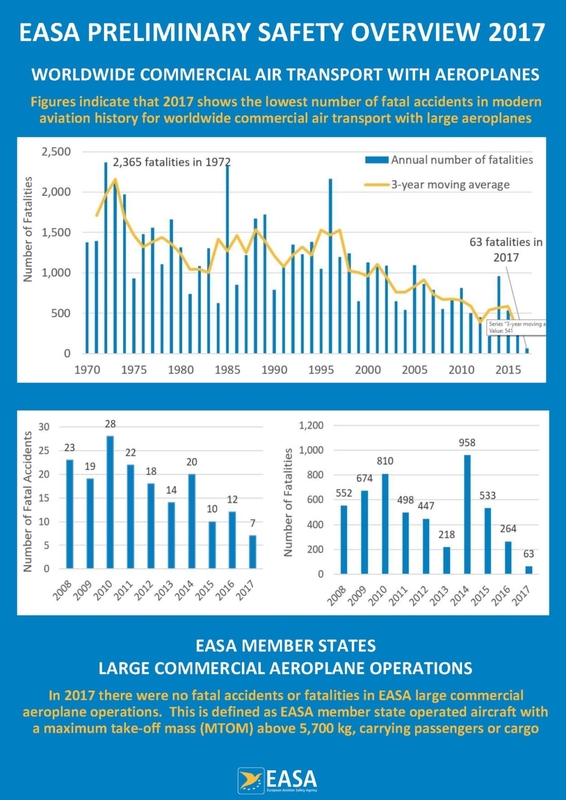 AS you can see the figures are not exactly the same as the ones shown by the Aviation Safety Network (ASN), as EASA also takes into account smaller commercial aircraft, but still show a very low number of fatalities in 2017: 63, and, of course the fact that there have been no fatal accidents or fatalities in EASA large commercial aeroplanes, defined as EASA member state operated aircraft with a maximum take-off mass (MTOM) above 5,700Kg, carrying passengers or cargo. It has been therefore no doubt the year with the lowest number of fatal accidents in modern aviation history for worldwide commercial air transport with large aeroplanes. As you can see, in 1972 there were 2,365 fatalities, having very similar figures in 1985 and 1996. These numbers are extremely different to the ones commercial aviation currently enjoys.If we focus on the numbers corresponding to last 10 years, fatalities climbed extraordinary in 2014, but have had a steady improvement since then. Let’s hope comercial aviation keeps having a down trendline, so that aircraft safety keeps reaching higher and higher standards every year! Additional Harness Systems that Allow for Rapid Egress. Source: NTSB. Collision with Terrain Hageland Aviation Services, Cessna 208B, N208SD. CRM as one of the main causes. Report published by NTSB. News on Recent Bird Strikes. Our Robotic falconry would prevent it. Incident: Blue B738 at Bucharest on Apr 22nd 2018, hydraulic failure. Source: Aviation Herald. Incident: ANZ B789 at Auckland on Apr 21st 2018, cabin did not pressurize properly. Source: The Aviation Herald. Our aim is to support foreign aircraft safety high-tech companies, so that we may team up as a co-ordinated partnership in order to introduce their products in Spain.